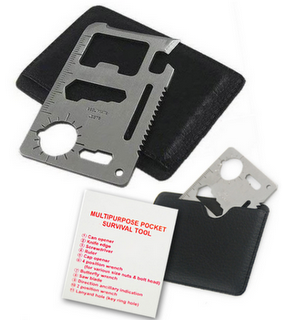 Free 11-In-1 Stainless Steel Card Tool Kit! 1SaleADay is giving away 50,000 stainless steel card tool kits! The only catch is that you need to create a new 1SaleADay account. If you're not familiar with them, they feature several blowout sales every day with prices up to 90% off or more! I have one of these tools and keep it in my wallet. I includes a can opener, screwdriver, wrench and other tools. It's about the size of a credit card and has come in handy quite a few times!